Winter was one for the record books. Spring has started cool and damp and we have seen little growth of grass so far. For these reasons, it is important that cattlemen let grass get a good start this spring before grazing. Managing pastures early is arguably more important than later in the year. Sure, keeping grass vegetative, managing seed heads, and knowing forage availability are all key to cattle performance. However, ultimately cattle performance and feed cost levels are dependent on healthy, productive pastures. From a plant perspective, grass needs to grow leaves to harvest sunlight and initiate photosynthesis. Without leaves to absorb the sunlight and initiate plant growth, root growth, and nutrition for the plant… grass dies out. Cattle that graze plants before they are 4-6 inches tall are removing the leaf and eliminating the ability for that plant to be efficient at harvesting sunlight. Overgrazing early is a sure way to kill plants, reduce pasture stands, and open space for weeds. Allow your pastures to grow to 4-6 inches before turnout. THEN, carefully monitor grass height. Rotating cows through paddocks or parts of the pasture to allow rest and plant regeneration is key to a successful grazing season. If you are not willing to rotationally graze at some level, you will need to delay turnout for longer or offer more acreage to assure ample supply of forage is available for a grazing season. 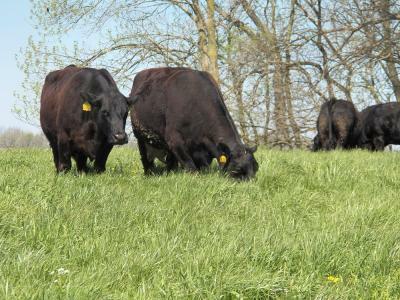 Cattle producers that focus on managing spring pastures correctly through delayed turnout, rotational grazing, and supplementing lush, high-protein forage will see less feed costs with a tighter calving season in 2015. Don't let this prolonged winter weather cloud your profit-driven decision process.